Take four geniuses and one waitress and what show do you think I'm talking about? Nope, it's not The Big Bang Theory. It's CBS's new procedural drama, Scorpion, about four brilliant, yet socially awkward people who help the government, and one regular waitress who tries to help them understand the world. As far as procedural shows go, CBS has a formula and sticks to it. Why do you think there are so many NCIS shows and were so many CSI shows at one point? But add a super smart, but socially inept character and what do you get? House MD, Monk, Numb3rs, Elementary, and Sherlock. Yeah, I think that whole schtick is getting a little tiresome, and honestly comparing anything to Sherlock is just unfair. 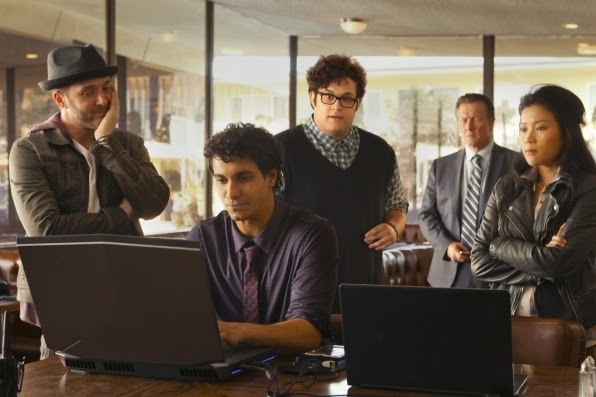 While the pilot episode of Scorpion didn't blow me away, I can unequivocally state that it was certainly "not bad." Elyes Gabel stars as Walter O'Brien, one of the five smartest people in the world and leader of the team. Eagle eyed viewers will remember him as Rakharo from Game of Thrones, one of the Dothraki's bloodriders who was sent on a scouting mission early in season 2, only to have his horse return with his decapitated head. Robert Patrick plays Agent Cabe Gallo, the government liaison who recruits the team. And Katharine McPhee is Paige, the waitress turned team member who's going to help translate the world for the team and essentially be our stand-in. And she also happens to be the mother of a genius. Convenient eh? We know Walter was a gifted child when helicopters descended on his location in Ireland for hacking into NASA. Here is where he met Agent Gallo, who asked him in his most T-1000-y voice, "What's your name son?" Flashforward to the present, and to hammer home just how socially awkward Walter is, he has somehow gotten a girlfriend for the last 3 months, but breaks up with her using a decision tree diagram and during a job where he's fixing a diner's Wi-Fi, "to be more efficient." I'm getting flashbacks to Sheldon Cooper and the Relationship Agreement. The rest of the team is introduced and consists of a mechanical genius who can break into or rewire anything, a hipster shrink who has a gift for reading people, and a numbers guru who spouts success probabilities with the annoyance of C-3PO. Anyway, a malfunction at LAX has stopped communication with 56 planes. So without any landing guidance, those planes will run out of fuel and crash. Aren't there any protocols in place for planes who can't contact their control towers?!? Amazing how one bug can screw up so much. And amazing how this hasn't happened before. When fixing the problem at LAX is thwarted by Los Angeles traffic, (see 24, there IS traffic!) the team diverts to the diner where Walter fixed the Wi-Fi. The plan is to restore the software by way of a backup. Of course the team is repeatedly roadblocked, no installation disks, an unmanned storage facility, and a corrupted hard drive, all stand in the way of success. After a "pep talk" by Paige which is outwardly explained to not work on geniuses, Walter realizes he can get a backup copy of the software from a plane. And this is where director Justin Lin does what he does best. You know Lin as the director of the last 3 Fast and Furious movies, and he managed to shove two high speed car scenes into the episode. The absolutely absurd climax involves connecting an Ethernet cable from a low flying airplane to a laptop in a conveniently placed Ferrari 458 to download the software. Everything barely works, LAX gets the quickest software reboot ever, and everyone lives happily ever after. As ridiculous as this last scene was, it wasn't any more ridiculous than two mustangs towing a vault behind them through downtown Rio, or driving a car through the nose of an exploding plane, but it was definitely just as slick so honestly, I'm okay with it. Yes it's a little cheesy, somewhat predictable, and definitely cliched, but those things don't make a series bad. Although it did for Intelligence. The characters aren't completely annoying, and I like the premise so I'll give Scorpion a few more episodes to either reel me in or just completely turn me off. Joaquin Phoenix as Doctor Strange?